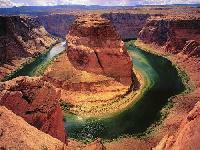 The Grand Canyon is one of the most remarkable natural wonders in the world. Located in the state of Arizona, USA, it is one of the deepest gorges on Earth with an average depth of one mile (1.6km) and an average width of ten miles (16km). The canyon was carved over the past 6 million years by the action of the Colorado River as it drops over 2,200 feet (670m) along the 277 mile (446 km) length of the gorge. For thousands of years, the area has been continuously inhabited by Native Americans who built settlements within the canyon and its many caves. The Pueblo people considered the Grand Canyon a holy site and made pilgrimages to it. Located in the Coral Sea, off the coast of Queensland, Australia. The great barrier reef is the world s largest individual formation created by living organisms. As the largest coral reef in the world, the Great Barrier Reef includes over 900 islands, over 2,900 separate reefs, and supports one of the most diverse ecosystems in the world. It is possible one of the grandest natural wonders in the world. It is the only wonder of nature that may be visible recognized from outer space. Mount Everest is the highest mountain in the world with the summit reaching a peak of 29,029 feet (8,848 m). It is located in the Himalayan mountain range on the border between Nepal and Tibet, China. Mt. Everest has a great deal of history behind it. It was named after Sir George Everest, surveyor general of India. On May 28, 1953 Sir Edmund Hillary and Tenzing Norgay were left behind by their companions. They hoped to be the first to climb the world s highest mountain.The next day they became the first people in the world to climb Mount Everest. The Garganta del Diablo (Devil s throat) with its U shape is undoubtedly the highlight of these majestic waterfalls. It is 82 metres high, 150 metres wide and 700 metres long, while the rest of the falls average 64 metres. Iguazu Falls has long been one of Argentina and Brazil s most popular touristic destinations. Over 2000 species of plants, 400 of birds and 70 mammals have been registered in the area. Par?cutin (volcano) is a cinder cone volcano in the Mexican state of Michoac?n. The volcano is unique in the fact that its evolution from creation to extinction was witnessed, observed and studied by human beings. It appears on many versions of the Natural Wonders of the World. Par?cutin is part of the Michoac?n Guanajuato volcanic field, which covers much of west central Mexico. It is part of the Ring of Fire. Table Mountain is a flat topped mountain forming a prominent landmark overlooking the city of Cape Town in South Africa. It is one of the New natural Wonders of world. It is a significant tourist attraction, with many visitors using the cableway or hiking to the top.